A court in North China's Hebei Province has launched an app to help local residents find indebted citizens by scanning WeChat, a move which some say enhances the social credit system but also raises concerns over privacy. A local resident surnamed Wang in Handan, a city in Hebei, accessed a so-called "deadbeat creditor map" on the WeChat platform and found in total 39 neighbors who have been racking up debt, according to a screenshot he shared with the Global Times on Wednesday. 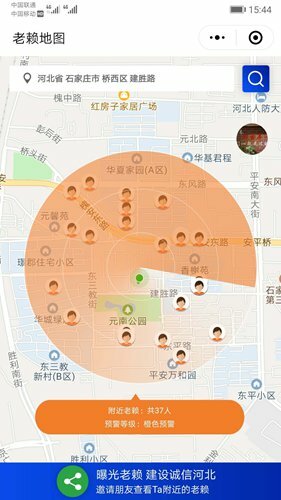 This mini app, developed by the Higher People's Court of Hebei, allows users to find out if there are any debtors within 500 meters. It was officially registered on December 29, 2018. A spokesperson with the court confirmed to the Global Times on Wednesday that it launched this app, and said that many have sent requests to the court to seek more information on it. Another resident surnamed Zong, living in Shijiazhuang, capital of the province, found out 37 debtors nearby including several individuals who violated regulations in reporting their financial status and one real estate agency that has not fulfilled obligations stated in related legal documents. Despite the ability of the program to identify debtors, it has its share of critics. The Handan resident said even if the app can scan indebted people around him, they are strangers to him, making it less meaningful. The app also sparked concerns over whether it risks infringing on people's privacy. However, Zhi Zhenfeng, a legal expert at the Chinese Academy of Social Sciences, told the Global Times that "As long as their ID and phone numbers do not appear on this platform, this app will not violate their rights." China has been strengthening nationwide creditworthiness in recent years, and courts have been exposing dishonest creditors for years, he noted. "Some listed creditors have been restricted from traveling and in consumption… and we've reached a good result overall," Zhi added. In 2014, China released an outline for building a government-led national social credit system, pledging to establish a set of laws and regulations regarding social credit, a credit reference system that covers the whole of society and a related reward and punishment system by 2020. Whether people rode trains without tickets, violated traffic laws, conducted heroic acts or performed exemplary acts - all are rated and the score plays a part in their life, determining whether he or she can buy a plane ticket, secure a loan and so on.